MEXICO CITY (Reuters) - Mexico's axolotl salamander can almost magically heal itself, holding the power to regrow its heart and brain. But there is one feat it may not pull off: survive dire threats to the last wild place it calls home. Plagued by polluted water, predatory fish and the steady encroachment of one of the world's biggest megacities, the tiny amphibian steeped in mythological lore has all but disappeared from its home in the muddy canals of southern Mexico City. Once a mainstay on the banquet tables of Aztec kings, in 1998 there were about 6,000 axolotls per square kilometer in the salamander's main redoubt, the waterways of the city's Xochimilco district, a scientific census showed. By 2004, the population had dropped to 1,000 per sq/km, and to less than 35 per sq/km a decade later. By 2020, there may be none, according to one model. Undeterred, a group of Mexican biologists have launched a rescue mission. "Without the axolotl, Mexico would lose part of its culture and identity," said Luis Zambrano, an urban biologist at Mexico's National Autonomous University (UNAM), who leads the team behind the plan. He argues that farmers in Xochimilco known as chinamperos, who grow a wide range of produce along some 180 kilometers of canals, are crucial players in the effort to build new sanctuaries for axolotl (pronounced ah-sho-LO-tul) while promoting traditional chinampa agriculture. Chinampas are floating gardens made from dredged-up black mud slathered on reeds and tree branches once used to produce as many as seven harvests a year for staples like corn and chili peppers. They flourished for over a thousand years in the lake that once filled the Valley of Mexico, where the Aztec imperial capital and later Mexico City would arise. Today, around 80 percent of the remaining chinampas have been abandoned as farmers seek better wages elsewhere. 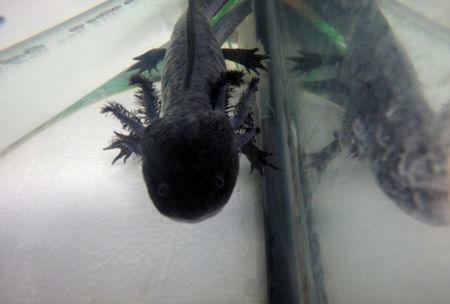 Over the next decade, Zambrano aims to enroll about half of Xochimilco's chinamperos into an axolotl-friendly organic certification scheme that would allow them to charge higher prices for their crops. The university-run certification aims to launch in 2019. With a modest budget, his team is creating 20 new sanctuaries with cleaner water using filters that also keep out the non-native tilapia and carp stalking the canals. Modern research into the axolotl began in 1864, after a shipment of 34 arrived in Paris from Mexico. Thousands more were then bred as scientists across Europe marveled at their strange appearance and ability to breathe with both lungs and gills. Researchers later discovered that axolotls can also absorb oxygen through their skin - making them particularly vulnerable to dirty water - and regenerate amputated limbs and damaged body tissue, creating intense interest in their genes. 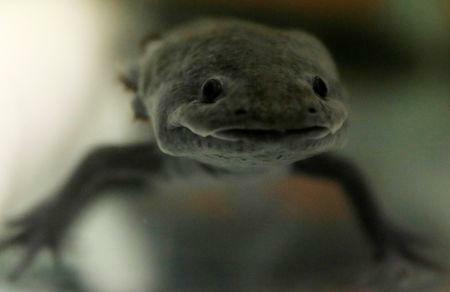 Earlier this year, a team of scientists in Germany said they had mapped the complete axolotl genome, revealing it to be 10 times longer than the human genome, which gives researchers more scope to pinpoint the mechanisms for regeneration. "You can actually take a primordial piece of the tissue that's going to form its eye and transplant it into the space around the gut and the axolotl will regenerate and form a whole eye there," said Randal Voss, a University of Kentucky scientist and director of the world's largest axolotl laboratory. But whether they have a future outside the laboratory will largely depend on whether Xochimilco's booming tilapia and carp populations can be controlled. The fish were introduced in the 1970s by the government as part of a nutrition program. 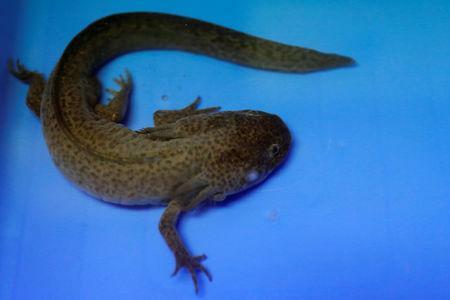 But their taste for axolotl eggs and juveniles was not considered. Industrial-scale fishing earlier this year removed tonnes of them from Xochimilco. But the effort has run out of funding. Claudia Sheinbaum, set to take over as Mexico City's next mayor in December and herself a scientist, said in a recent interview that she wants the capital's water infrastructure overhauled, and the raw sewage that pollutes the Xochimilco canals when heavy rains overwhelm the aging pipes to be contained. Its future hanging in the balance, the axolotl has for years played an outsized cultural role in Mexico and beyond. In Aztec legend, the desperate rebel god Xolotl transformed himself into an axolotl to hide and avoid his own sacrifice at the hands of his fellow gods. He was still discovered, captured and killed. Axolotls have appeared in Diego Rivera's murals and Pokemon video games. They even helped inspire the look of the main character Toothless in DreamWorks Animation's hit "How to Train Your Dragon" movies. "There's definitely a cuteness that comes through. The way it stands, the way its eyes are, the shape of its mouth," said Simon Otto, head of character animation for the films. The third installment of the series due out in March draws heavily on rare albino axolotls for a new character, he said. A few pinkish-white amphibians wiggle around in aquariums at Horacio Mena's axolotl laboratory on the UNAM campus. But most are grey or black, better suited to avoid predators. Some move toward the edge of the glass and even appear to make eye contact with approaching visitors. Mena explained how the new sanctuaries will be stocked over the coming months to give the species a new foothold. "My dream is to see them live freely," he said, "and return to this mythical part of Mexico that is Xochimilco."